Having passwords expire is necessary for security, but it is a burden on both users and the IT helpdesk. Active Directory password expiration notification can help with that. If users are reminded to change their Active Directory passwords several days before the password expiration date, everybody wins: You can maintain a strong password policy without users getting locked out of their accounts, business operations being stalled or the helpdesk being overwhelmed with password reset calls. However, native tools do not offer a complete solution. Windows automatically notifies users only during interactive logons; users who log on non-interactively through VPN or RDP to Outlook, file shares and other systems won't see a notification, nor will users who have been out of office for a significant time. Netwrix Auditor for Active Directory fully addresses the problem of password expiration by periodically checking all accounts in the AD domains or OUs you specify to identify users whose passwords will expire within the specified number of days. Then it automatically sends Active Directory password expiration notification emails to the account owners and sends summary reports to system administrators. 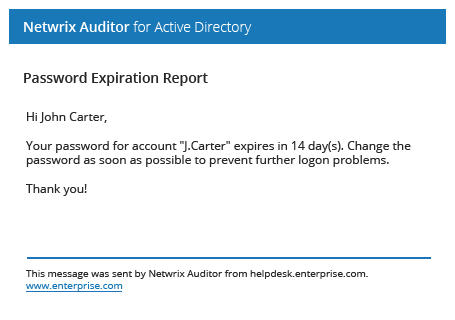 By taking a proactive approach to the password expiration problem with Netwrix Auditor, you can maintain a strong password security policy while reducing helpdesk workload and maximizing productivity and service uptime.